The Genealogy Department of the Porter County Public Library System will hold a beginner's genealogy workshop on Monday, August 6 from 6:15 to 8:45 pm at the South Haven Public Library (403 West 700 North, Valparaiso, IN 46355). The workshop is for people just starting to trace their family history, as well as for those more experienced in genealogy who want to get better acquainted with the resources available at the Porter County Public Library in Valparaiso. Larry Clark, Porter County Genealogist, County Historian, and head of the Genealogy Department, will conduct this free workshop. Registration is required - call (219) 759-4474. The Indiana African American Genealogy Group will hold their annual genealogy workshop on Saturday, August 11 from 9 am to 3 pm at the Eiteljorg Museum in Indianapolis. The theme of the workshop is "Journey to Discovery," and Deborah A. Abbott, Ph.D. will be the featured speaker. Sessions will be offered on "Analyzing Census Records," "Researching in Libraries and Archives" and "How to Verify Oral History." There will also be a question and answer session. Registration is $20 for IAAGG members, $25 for non-members. The Indiana Genealogical Society now has 827 databases in the Members Only area. Each of Indiana's 92 counties has at least 3 databases. I am looking for information about my great-grandfather William Henry CAWOOD who was born in Indiana abt. 1855. His father was Moses CAWOOD (born in Indiana about 1820) and his mother was Jane ELMORE, who married March 24, 1853 in Daviess County, Indiana (Jane was Moses' second wife). Moses Cawood (sometimes spelled CAYWOOD) is in the 1850 and 1860 censuses in Daviess County, Indiana, and then in the 1870 census is in Cherokee County, Kansas. My great-grandfather William Henry Cawood married Emma O'NEIL. I do not know when or where that marriage occurred; however, my grandfather, their youngest child, and his older sister were born in Arkansas. I would appricate any help you could provide. The Indiana Genealogical Society now has 826 databases in the Members Only area. Each of Indiana's 92 counties has at least 3 databases. The Indiana Genealogical Society now has 825 databases in the Members Only area. Each of Indiana's 92 counties has at least 3 databases. The Indiana Genealogical Society now has 824 databases in the Members Only area. Each of Indiana's 92 counties has at least 3 databases. The Indiana Boys' School was a state correctional institution established in Plainfield, Indiana in 1867 to reform male juvenile offenders through education. Judges from courts across Indiana could commit boys to the school if they had been charged with a crime or with being delinquent. In more recent times, the institution was called the Plainfield Juvenile Correctional Facility. This database was extracted from information in the 1940 census for Hendricks County, Indiana and includes the date when each inmate was admitted (which ranges between 1932 and 1940). It is a premium database, accessible only to IGS members. The Indiana Genealogical Society now has 823 databases in the Members Only area. Each of Indiana's 92 counties has at least 3 databases. Steve Rafferty, president of the Ancestral Trails Historical Society, will present a program, "Ancestral Trails: What We Have To Offer," at the Thursday, July 5 meeting of the Southern Indiana Genealogical Society. The ATHS works to preserve cemeteries, historic buildings, public records and historical and genealogical collections. Its focus is on Harrison County, Indiana and ten counties in Kentucky. The meeting begins at 7 pm in the Strassweg Auditorium of the New Albany-Floyd County Library, 180 W. Spring St., New Albany, Indiana. The Indiana Genealogical Society now has 822 databases in the Members Only area. Each of Indiana's 92 counties has at least 3 databases. The Indiana Genealogical Society now has 821 databases in the Members Only area. Each of Indiana's 92 counties has at least 3 databases. FamilySearch has posted a free index of Indiana in the 1940 census. The index is at https://familysearch.org/1940census/1940-census-indiana/ and also includes a link to the image of the specific census page. Both the index and the images are free to the public and are part of the 1940 Census Community Project. Way to go, volunteers!! The LaPorte County, Indiana Genealogical Society will discuss the records of the Indianapolis Oprhan Asylum records at their meeting on Tuesday, July 10 at 7 pm. From 1851-1941, parents and children in trouble found help at the Indianapolis Orphan Asylum. Most of its records survive at the Indiana Historical Society -- dozens of volumes documenting life events among the people hardest to trace, those at the bottom of the social ladder. Harold Henderson came across this collection by accident while searching for his great-grandfather's cousin, and published an article about it in the Spring-Summer 2011 issue of the magazine The Hoosier Genealogist: Connections. Find out more about the institution, the records, and the children (who were not always orphans!) at the meeting, which will be held at the Swanson Center for Older Adults (910 State St., LaPorte, IN). The Indiana Genealogical Society now has 820 databases in the Members Only area. They cover all 92 Indiana counties and encompass 500,000+ records. Affiant further says that since the death of her said husband the said C.W. Spaulding and since the birth of her said two children (vz. William Alfred and Lula) she has since intermarried with one Tayler May with whom she is now living. The Indiana Genealogical Society now has 818 databases in the Members Only area. They cover all 92 Indiana counties and encompass 500,000+ records. The Indiana Genealogical Society has added the June 2012 issue of Indiana Genealogist, the society's quarterly publication, to the Members Only area. IGS members can login to the IGS Records section to download their copy. The Indiana Genealogical Society now has 817 databases in the Members Only area. They cover all 92 Indiana counties and encompass 500,000+ records. The Indiana State Library in Indianapolis is holding a "Genealogy for Night Owls" event on Wednesday, August 15 from 5:30 to 8:30 pm. You will be able to work on your genealogy research, use the library's access to subscription databases such as Ancestry.com Library Edition, and get tips from Indiana State Library and Indiana State Archives' staff. The event is free and open to the public - registration is required (the deadline to register is August 8). To register, phone (317) 232-3689 or e-mail charlesh@library.in.gov. Knox County's early court records will be discussed at the Wabash Valley Genealogy Society's next meeting. The meeting, which will take place on Monday, July 9 at 6:15 pm at the Vigo County Public Library in Terre Haute, will feature a program by Brian Spangle on "Early Knox County, Indiana, Court Records: Civil, Criminal and Probate." Knox County has an important role when researching early Indiana ancestors, as it was the territorial seat and the "parent county" from which other counties were formed. The Indiana Genealogical Society now has 815 databases in the Members Only area. They cover all 92 Indiana counties and encompass 500,000+ records. The Indiana Genealogical Society now has 813 databases in the Members Only area. They cover all 92 Indiana counties and encompass 500,000+ records. The Indiana Genealogical Society now has 812 databases in the Members Only area. They cover all 92 Indiana counties and encompass 500,000+ records. 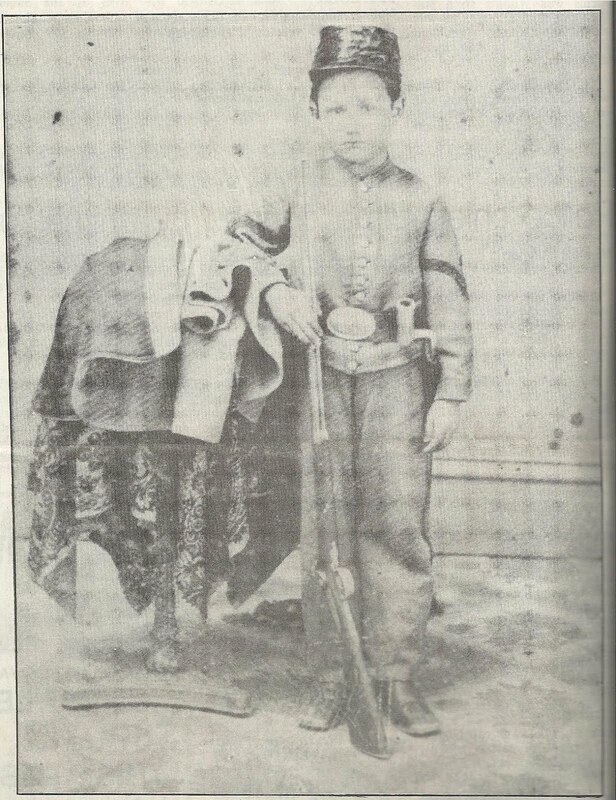 Civil War's Youngest Soldier From Indiana? The blog of the Washington State Library has an interesting post about William Henry Bush, one of its residents. W.H. Bush made the news there for the detailed answers he gave on a jury questionnaire in 1909, but he was originally from Porter County and LaPorte County, Indiana. 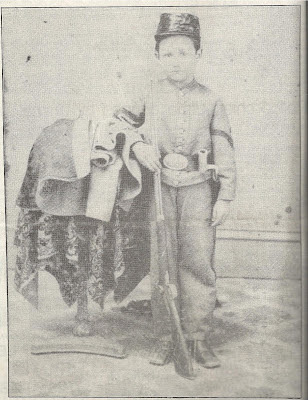 He is also newsworthy because at the age of 5, "Willie" Bush served in the Civil War as a valet to his father Asahel Bush in the 4th Battery, Indiana Light Artillery. He was apparently issued a uniform (see photo). Many thanks to Matthew Roach for sharing these details on the Washington State Library's blog, and to Steve Willis for alerting us to this blog post. Got a brick wall research problem? Bring it with you to the Genealogical Society of Marion County's meeting at Crown Hill Cemetery Waiting Station in Indianapolis. On Saturday, June 16 from 1 to 3 pm, the society will field research problems and questions in an open forum format. All attendees are encouraged to offer suggestions on what sources to check, how to tackle a specific research problem, where to find additional help, etc. The Indiana Genealogical Society now has 810 databases in the Members Only area. They cover all 92 Indiana counties and encompass 500,000+ records. The Indiana Genealogical Society now has 803 databases in the Members Only area. They cover all 92 Indiana counties and encompass 500,000+ records. Looking for information on a Thomas Barry RYAN b. in Indiana m. to a Ella ALEXANDER in Laplace LA. Two sons were born to this union Allan and Gean Ryan. I believe that Thomas came back to Indiana and died there somewhere. His father's name was Lawrence RYAN. Editor's Note: To help readers with the time frame of this query, we researched and found a family tree that says Ella Alexander was born in 1908 and died in 1979. She was married sometime after the 1930 census, where she is listed as single living in Louisiana. Grover Lee CAMPBELL (b. 14 April 1885) and Sarah Jane HORNADAY CAMPBELL (b.7 Oct 1883) married 24 Jan 1903 in Alamance County, North Carolina before moving to Indiana. Sarah Jane d. 11 Feb 1969 and Grover d. 16 Dec 1969 in Indiana. I am trying to find more about Sarah Jane's Mother, who was the daughter of Henry Thomas Rich and Mary Polly ABRIGTH Sarah Jane's Mother married John G. HORNADAY, they were from Alamance County, NC. Her name was also Sarah Jane RICH HORNADAY. The Indiana Genealogical Society now has 801 databases in the Members Only area. They cover all 92 Indiana counties and encompass 500,000+ records. The Indiana Genealogical Society now has 799 databases in the Members Only area. They cover all 92 Indiana counties and encompass 500,000+ records. The Indiana Genealogical Society has added the June 2012 issue of IGS Newsletter, the society's bi-monthly newsletter for IGS members, to the Members Only area. IGS members can login to the IGS Records section to download their copy. In this issue, President Michael Maben spotlights the problem of legislative attempts to limit public access to the Social Security Death Index. We also have a wrap-up from our annual conference in Fort Wayne (complete with photos), in addition to news items from around the state. Congratulations to the Allen County Genealogical Society of Indiana! On June 1st, 16 volunteers from the society completed their index of the 1940 census for Allen County, which listed over 155,000 entries. This index is available for free in the Records section of their website and includes a link to the digital image of the census page. In 1862 the United States government instituted a draft to help fill the regiments serving in the Civil War. Every able-bodied man between the ages of 18 and 45 was required to enroll, or else provide a reason why they were exempt. These draft enrollment lists have been microfilmed and are available at the Indiana State Archives. The Indiana Genealogical Society now has 798 databases in the Members Only area. They cover all 92 Indiana counties and encompass 500,000+ records.